The new Facebook pixel allows you to place a single pixel across your entire website to report conversions, build audiences and get rich insights about how people use your website. The Facebook pixel combines the power of the conversion pixel and the Custom Audience pixel into a single pixel. With the new update, you can now use the Facebook pixel to measure, optimize and build audiences for your ad campaigns, and no longer need to implement the conversion pixel and custom-audience pixel. Facebook mentioned that they are removing the conversion tracking pixel in the second half of 2016. 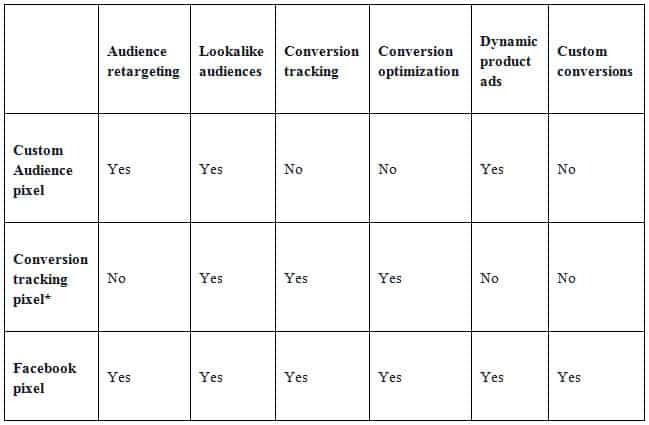 For conversion tracking, optimization and remarketing, Facebook recommends upgrading to the Facebook pixel. If you have an existing Custom Audience pixel, you can continue to use it and just add standard events for conversion tracking and optimization.